Accurate setting of volume levels is important to optimise the amplification range in the analogue domain, as well as to minimise quantisation and granular noise in the digital domain. 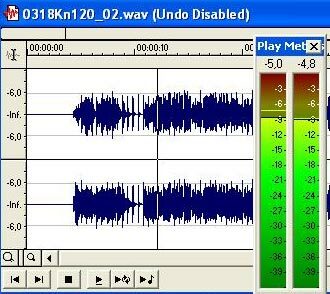 If the digital recording level exceeds digital zero, the result is clipping. Higher bit depths provide greater dynamic range and, thus, some headroom may be left in order to avoid clipping. Use peak-level meters, rather than volume-unit meters, to check the level of recording. The optimal recording level is in theory as close to digital zero as possible, but in practice one should leave some headroom (3 dB or even 6 dB). It has to be ensured that the signal input level at the digitisation process does not produce clipping.